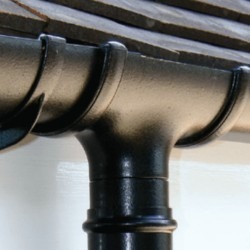 Cast Iron Effect Guttering combines classic styling with all the benefits of PVC including a maintenance free finish. FloPlast's Cast Iron Effect is actually a textured finish which is applied as part of a two-stage process. The final coating, which has been tested in a weather test accelarator to the highest extremes, is baked to ensure that it stands the test of time hence the industry-leading guarantee. Choose from our Half Round, Deepflow or Ogee profiles. Each of our Cast Iron Effect systems is guaranteed for 20 years, and it has actually been proven to last in excess of 50 years under acceleratd weather test conditions. The whole system is covered by British Standard Institute Kitemarks. As a word of caution, beware of fakes. We have been made aware of some small operators who are buying in standard gutter systems and applying a cast iron effect paint themselves. This will not have been tested under proper testing conditions (if at all), it is very unlikely that the paint finish will last and the guarantee will be invalid. 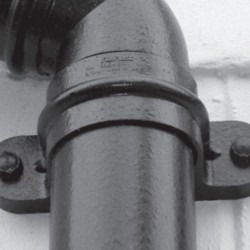 Available in Half Round, Deep Flow and Ogee styles, with a choice of round and square downpipes, there is a design to suit all types of properties old and new. With a range of decorative hoppers and motifs to complement any of these systems you can turn what was once a functional piece of plumbing into an eye-catching feature. For your peace of mind each system is protected by the same 20 year colour and performance guarantee. FloPlast's Cast Iron Effect is actually a textured finish which is applied as part of a two-stage process. The paint has a special formulation which as been developed over an extended time period.The final coating, which has been tested in a weather test accelarator to the highest extremes, is baked to ensure that it stands the test of time, hence the industry-leading guarantee. The outcome is a product which displays all the benefits of PVC but with the appearance of real cast iron. This is no different to the installation process for standard finish gutters - please refer to our Guides & Tips section for more details. Want some advice on how to install your Cast Iron Effect Gutters, or interested in finding out more about our product range, take a look at our guides & tips.